Detailed minutes can prove troublesome for your association. Minutes are required at any association or board meeting. They serve as a record of the actions and decisions made at a meeting; however, they are not meant to be a transcript of everything that was said or done at the meeting. The more unnecessary, superfluous detail that is included in board meeting minutes, the more likely the board’s actions will fall under unnecessary scrutiny by homeowners. Certain widely accepted guidelines will help your association take appropriate meeting minutes. The minutes should begin with the association name and the date and place of the meeting. It should also state what type of meeting is being held, i.e. whether it is a regular or executive session board meeting, whether it is a special meeting of the board or membership, or whether it is an annual association membership meeting. Those in attendance in an official capacity (such as a board member, manager, guest, attorney, or similar guest) should be noted. The presence of a quorum and the time the meeting was called to order should be included. It is important to note if the association’s attorney was present at an executive session meeting. This will protect the association’s attorney-client privilege that may attach to communications at the meeting that are referenced in the minutes taken during the meeting and help ensure that the minutes are subject to the privilege. Timing elements should also be stated. The time the meeting is called to order, any board member who arrives late or leaves early (which may affect any vote taken) and when the meeting is adjourned should be stated. It takes more thought to reduce a half-hour discussion into a brief statement for the minutes. The minutes should reflect the decision of the board. Extensive debate during a meeting should not be reported; opinions and conclusions of those in attendance should be avoided. Reject individual demands to specifically note why a board member voted against a motion and their personal reasons for same – it is irrelevant, because all you need to record is the decision of the Board. The secretary should instead describe what occurred (the motion that was made for example) and summarize the details and conclusions reached. Once again, minutes should be brief yet accurately reflect the proceedings of the meeting, and in particular the decision of the board so there is a record of that decision. This requires more attention and skill than just simply writing down everything that is said. 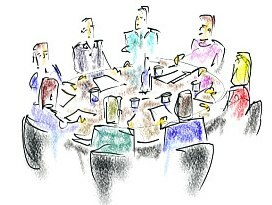 It is easier to document decisions made at a well-structured and organized meeting. If the meeting is run with a concise and clearly worded agenda and proper procedures are followed, the minutes should flow accordingly. An agenda must be prepared and distributed before the meeting, as the Code requires that it be part of the notice. The President (or whoever is presiding over the meeting) should follow the agenda. It is also helpful if time estimates are listed next to the agenda items so that the meeting can proceed timely and the Board will not get sidetracked on particular issues. Civil Code Section 4930 describes exceptions to the requirement that the Board only address the items listed on the agenda: (1) a member of the Board, a managing agent, or other agent of the Board may: (a) briefly respond to statements made or questions posed by a person speaking at the meeting or (b) ask a question for clarification, make a brief announcement, or make a brief report on his or her own activities; (2) a member of the Board or the Board collectively, subject to rules or procedures of the Board, may: (a) provide a reference to, or provide other resources for factual information to, its managing agent or other agents or staff, (b) request its managing agent or other agents or staff to report to the Board at a subsequent meeting concerning any matter, or take action to direct its managing agent or other agents or staff to place a matter on a future agenda, or (c) direct its managing agent or other agents or staff to perform administrative tasks necessary to carry out the foregoing; or (3) an emergency situation exists, which means there are circumstances that could not have been reasonably foreseen by the Board, that require immediate attention and possible action by the Board, and that, of necessity, make it impracticable to provide notice. Motions made and seconded for voting should be repeated clearly so that all in attendance (particularly those who need to vote on the matter) have heard and understand the motion. Specific discussion about the motion is unnecessary. Instead, the motion itself and who made the motion should be stated. Whoever seconded the motion must be stated. Any significant amendment to the motion or points made about the motion can be stated. Also, the vote taken and result obtained should be stated. A word about motions is appropriate. Issues that will be the subject of a motion during a meeting should be placed on the agenda. A motion is brought by a board member on the specific subject agendized. The motion is usually presented orally, and it must be seconded before discussion is permitted. Any reports regarding the motion should be provided and discussed before a vote is taken. Once a motion is pending, no other motion can be made until the disposition of the previous motion; however, a motion to table a matter (put it on hold for a later date) takes precedence over the earlier motion. The secondary motion must be decided before the principal motion can proceed. Also, a motion to amend or reword a previous motion made must be determined before the final vote taken on the principal motion. Debate during a discussion period on a motion need not be stated. On the other hand, background information on the subject of the motion that is brought before the Board should be stated. A motion must be recorded verbatim in the minutes. The secretary or other person taking minutes must be objective. They must not express personal opinion, criticism or praise on anything recorded. Neither the notes nor any tape recordings by the secretary of the meeting are official records. Only the approved minutes of the Board meeting is the official record. Notes and tape recordings should be destroyed following the approval of the minutes for that meeting. If any particular Board member wishes more detail, he or she can take their own notes so that they can remember what took place. These notes constitute personal records of the Board member and not official records of the meeting of the Board. Minutes should be prepared as soon as possible after the meeting. The longer the secretary waits to transcribe minutes, the less accurate they tend to be. Minutes should be approved at the next regular Board meeting. Once approved, they are signed by the Secretary of the Board for that meeting and thereafter become the official record of the meeting. Minutes are maintained by the secretary for access by the Board or other members. The fact that a meeting may take several hours to conduct does not mean that the minutes reflecting the business transacted at that meeting should also be equally lengthy. Much of what is discussed during a meeting or that which delays the progress of the meeting is not official business transacted at the meeting that should be reflected in an official record of that meeting. Sandra L. Gottlieb is the Managing Partner at SwedelsonGottlieb, specializing in the legal representation of community associations, and a principal of Association Lien Services, California’s leader in assessment collections. She can be contacted at slg@sghoalaw.com.